For Fukuoka, he employs 4 main methods (no tilling, no chemical fertilizer or prepared compost, no weeding and no pesticides) that are meant to allow the land to return to its original biological balance prior to massive human intervention. They are outlined in his book One Straw Revolution. Through these methods he has managed to minimize pollution, while still reaping similar yields as his neighbors using more 'modern' methods. His methods are similar to what we could refer to permaculture or a similar cousin, integrated farming, which is also a very important aspect of the methods found at the Songhai Centre in Benin, West Africa. The idea of reaching for a natural balance and wholeness outside of industrially-formed intuitions is an important proposition. 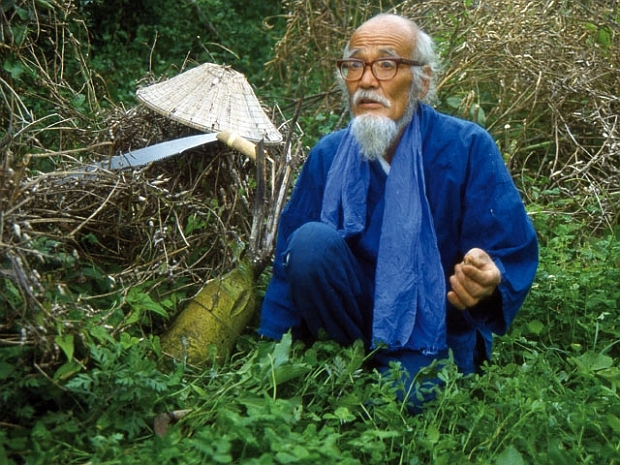 Masanobu Fukuoka, with his grizzled white beard, subdued voice, and traditional Oriental working clothes, may not seem like an apt prototype of a successful innovative farmer. Nor does it, at first glance, appear possible that his rice fields—riotous jungles of tangled weeds, clover, and grain—are among the most productive pieces of land in Japan. But that's all part of the paradox that surrounds this man and his method of natural farming. On a mountain overlooking Matsuyama Bay on the southern Japanese island of Shikoku, Fukuoka-san (son is the traditional Japanese form of respectful address) has—since the end of World War II—raised rice, winter grain, and citrus crops . . . using practices that some people might consider backward (or even foolish!). Yet his acres consistently produce harvests that equal or surpass those of his neighbors who use labor-intensive, chemical-dependent methods. Fukuoka's system of farming is amazing not only for its yields, but also for the fact that he has not plowed his fields for more than 30 years! Nor does he use prepared fertilizer—not even compost—on his land, or weed his rows, or flood his rice paddies. Through painstaking experimentation, you see, this Japanese grower has come up with a method of agriculture that reflects the deep affinity he feels with nature. He believes that by expanding our intellect beyond the traditional confines of scientific knowledge—and by trusting the inherent wisdom of life processes—we can learn all we need to know about growing food crops. A farmer, he says, should carefully watch the cycles of nature and then work with those patterns, rather than try to conquer and "tame" them. In keeping with that philosophy, Fukuoka-san's fields display the diversity and plant succession that is a natural part of any ecosystem. In the spring, he sows rice amidst his winter grain . . . then, late in the year, casts grain seed among the maturing rice plants. A ground cover of clover and straw underlies the crops, deterring weeds and enriching the soil. In addition, the master gardener grows vegetables "wild" beneath the unpruned trees in his mountainside orchard. Naturally, such unconventional plots might look positively disastrous to traditional agronomists, but as Fukuoka points out to skeptical visitors, "The proof of my techniques is ripening right before your eyes!" For many years, the Oriental gentleman's unique ideas were known only to a few individuals in his own country. In 1975, however, he wrote a book entitled The One-Straw Revolution, which was later published in the United States. Since then, he has been in great demand by groups eager to know more about this strange "new" attitude toward farming. In 1979 Fukuoka-san undertook an extensive tour of the United States . . . and while he was in Amherst, Massachusetts for a series of university lectures, he talked for several hours with Larry Korn, a student of natural farming methods and the editor of The One-Straw Revolution. Their conversation was conducted entirely in Japanese and later translated into the edited version printed here. Incidentally, if you're puzzled by several instances of apparent contradiction in the following comments, consider that Fukuoka-like the Oriental philosophers who deliberately present students with what seem to be illogical statements or paradoxes—is perhaps trying to help people break habitual patterns of thought and develop new perceptions. And because his natural farming does demand such an unaccustomed mode of thinking, Fukuoka-san warns that it is not for the timid or the lazy: "My method completely contradicts modern agricultural techniques. It throws scientific knowledge and traditional farming know-how right out the window." What's left in the wake of that revolutionary (and sometimes admittedly befuddling) upheaval, however, should excite—and challenge—anyone who'd like to see a simpler, more natural form a of agriculture take root. PLOWBOY: Then successful natural farming is not simply a do-nothing technique? FUKUOKA: No, it actually involves a process of bringing your mind as closely in line as possible with the natural functioning of the environment. However, you have to be careful: This method does not mean that we should suddenly throw away all the scientific knowledge about horticulture that we already have. That course of action is simply abandonment, because it ignores the cycle of dependence that humans have imposed upon an altered ecosystem. If a farmer does abandon his or her "tame" fields completely to nature, mistakes and destruction are inevitable. The real path to natural farming requires that a person know what unaltered nature is, so that he or she can instinctively understand what needs to be done—and what must not be done—to work in harmony with its processes. PLOWBOY: For folks who may be unfamiliar with your book, The One-Straw Revolution, let's review the basic practices you follow in your natural system of growing grain, vegetables, and citrus. FUKUOKA: First of all, I operate under four firm principles. The first is NO TILLING . . . that is, no turning or plowing of the soil. Instead, I let the earth cultivate itself by means of the penetration of plant roots and the digging activity of micro-organisms, earthworms, and small animals. The second rule is NO CHEMICAL FERTILIZER OR PREPARED COMPOST. I've found that you can actually drain the soil of essential nutrients by careless use of such dressings! Left alone, the earth maintains its own fertility, in accordance with the orderly cycle of plant and animal life. The third guideline I follow is NO WEEDING, either by cultivation or by herbicides. Weeds play an important part in building soil fertility and in balancing the biological community . . . so I make it a practice to control—rather than eliminate—the weeds in my fields. Straw mulch, a ground cover of white clover interplanted with the crops, and temporary flooding all provide effective weed control in my fields. The final principle of natural farming is NO PESTICIDES. As I've emphasized before, nature is in perfect balance when left alone. Of course, harmful insects and diseases are always present, but normally not to such an extent that poisonous chemicals are required to correct the situation. The only sensible approach to disease and insect control, I think, is to grow sturdy crops in a healthy environment. As far as my planting program goes, I simply broadcast rye and barley seed on separate fields in the fall . . . while the rice in those areas is still standing. A few weeks after that I harvest the rice, and then spread its straw back over the fields as mulch. The two winter grains are usually cut about the 20th of May . . . but two weeks or so before those crops have fully matured, I broadcast rice seed right over them. After the rye and barley have been harvested and threshed, I spread their straw back over the field to protect the rice seedlings. I also grow white clover and weeds in these same fields. The legume is sown among the rice plants in early fall. And the weeds I don't have to worry about . . . they reseed themselves quite easily! In a 1-1/4-acre field like mine, one or two people can do all the work of growing rice and winter grain in a matter of a few days, without keeping the field flooded all season . . . without using compost, fertilizer, herbicides, or other chemicals . . . and without plowing one inch of the field! It seems unlikely to me that there could be a simpler way of raising grain. As for citrus, I grow several varieties on the hillsides near my home. As I told you, I started natural farming after the war with just one small plot, but gradually I acquired additional acreage by taking over surrounding pieces of abandoned land and caring for them by hand. First, I had to recondition that red clay soil by planting clover as a ground cover and allowing the weeds to return. I also introduced a few hardy vegetables—such as the Japanese daikon radish—and allowed the natural predators to take care of insect pests. As a result of that thick weed/clover cover, the surface layer of the orchard soil has becomeover the past 30 years-loose, darkcolored, and rich with earthworms and organic matter. In my orchard there are now pines and cedar trees, a few pear trees, persimmons, loquats, Japanese cherries, and many other native varieties growing among the citrus trees. I also have the nitrogen-fixing acacia, which helps to enrich the soil deep in the ground. So by raising tall trees for windbreaks, citrus underneath, and a green manure cover down on the surface, I have found a way to take it easy and let the orchard manage itself! PLOWBOY: Have you encountered any really serious problems with disease or insect pests over the decades that you've been practicing natural farming? FUKUOKA: Since I turned the fields back to their natural state, I can't say I've had any really difficult problems with insects or disease. Even when it looked as if something had gone wrong and the crops would soon be devastated, nature always seemed to bail me out in the end! Of course, I have made mistakes . . . just as every grower does. However, I never really think of them as mistakes! Back in the beginning, for example, when 70% of a field was overgrown and unproductive and 20 to 30% was extremely productive, I saw my limited harvest as a success. I figured that if a small percentage of the field did produce, I could eventually make the rest of the acreage do just as well. My neighbors would never have been satisfied with a field like that . . . but I just viewed the "mistake" as a hint or a lesson. One of the most important discoveries I made in those early years was that to succeed at natural farming, you have to get rid of your expectations. Such "products" of the mind are often incorrect or unrealistic . . . and can lead you to think you've made a mistake if they're not met. PLOWBOY: Some people have noticed a spiritual, almost mystical quality to your theory of farming. Do you feel you're receiving insight and guidance from a divine source? FUKUOKA: Although natural farming—since it can teach people to cultivate a deep understanding of nature—may lead to spiritual insight, it's not strictly a spiritual practice. Natural farming is just farming, nothing more. You don't have to be a spiritually oriented person to practice my methods. Anyone who can approach these concepts with a clear, open mind will be starting off well. In fact, the person who can most easily take up natural agriculture is the one who doesn't have any of the common adult obstructing blocks of desire, philosophy, or religion . . . the person who has the mind and heart of a child. One must simply know nature . . . real nature, not the one we think we know! PLOWBOY: Can you be more specific about what that attitude should be? FUKUOKA: Many people think that, when we practice agriculture, nature is helping us in our efforts to grow food. That is an exclusively human-centered viewpoint . . . we should, instead, realize that we are receiving that which nature decides to give us. A farmer does not grow something in the sense that he or she creates it. That human is only a small part of the whole process by which nature expresses its being. The farmer has very little influence over that process . . . other than being there and doing his or her small part.